While I love the bright color trend I've always been attracted to soft pastel colors. This blazer from Storets is a new favorite of mine. It's a beautiful sea foam green and paired with my pink nails and cream top I look like a bag of Jordan Almonds. My blouse was designed by Kendall K. and has beautiful feminine detailing--a nice contrast to my more masculine blazer. Always love your use of color! That blazer is amazing and looks great on you! I love those shoes and that top! So wonderfully feminine and vintage looking. That blazer is fabulously minty and fresh and super crisp. what a fun blazer, beautiful! Love the blazer. I have a blazer addiction actually, they are so versatile. Gorgeous blazer I really love the color!! Such a great outfit! I love your blog, always so inspirational! The dainty blouse is really pretty and romantic. And I love the vivid color of the blazer on you; it does make a great contrast with the blouse. Beautiful colour palette! that jacket is gorgeous! great nail colour choice too! this is such a pretty outfit! the colors are very complimentary. love the blazer! This is so pretty, I love the green blazer! And I have that same orange h&m bracelet! Kind of wishing I picked up more, they're so easy to throw on for a touch of color! You look super cute here! Love the jacket, don't know if it qualifies as a pastel, because it is still so lively and vibrant. And I love it with the pop of color on your lips too! And the layered bracelets really add a nice touch. Excellent! That Blazer is totally gorgeous :) I love the pastel shades. Pretty lady! cute outfit Taylor. I am obsessed with anything with gold buttons. i am in love with Pastel colours though it has to be the right season for my skin tone. You pull the blazer off great! i have been looking for a seafoam green blazer (i know that sounds strange but i have). i wish they still had it on their website - i don't see it! it looks great on you! that blazer is SO gorgeous. love the colour. LOVING the colour of that blazer! u look fab, love all the colors ! Love your shoes! I love how all the colors look together. Love your style, your pictures and your post. You are one of the bests! Absolutely gorgeous! I can't wait for Glitter Guide! and the outfit is just perfect. love a nice blazer. i can't get enough blazers actually..
love it. and the shoes too. i need those simple gold band rings. That jacket is such a great color for summer! Hope you're having a great vacay!! so beautiful all together, i'm in love with the blazer and it's color! Love the color against your blonde locks T! The tones of this ensemble remind me of idyllic summers by the coast...very Hamptons chic! That color is so beautiful on you... You look amazing! Great outfit! 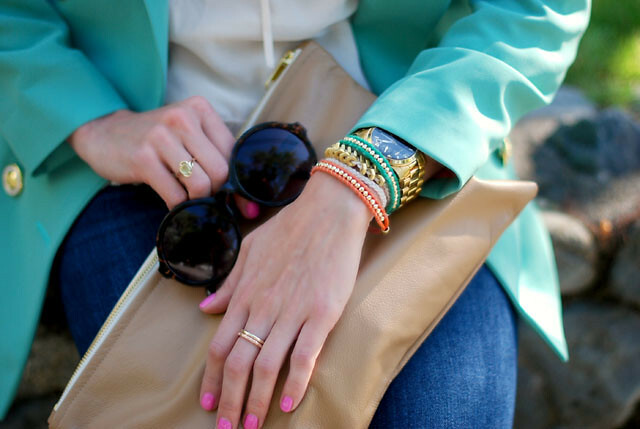 Love that blazer and all those bracelets! that blazer is stunning on you! and i need more of those h&m bracelets. they're perfect! LOVE this blazer! The color is so fresh, perfect for spring & summer! Pretty outfit, I really like the blazer, the colour is really nice.Love your nails! The blazer is beautiful and your nails just pop perfectly against it! Oh love your blazer ! So beautiful colors ! I think this is my favourite post of all the outfits you've blogged so far! The colour of that blazer is perfection personified. I love it! I LOVE the second to last photo!!! That jacket is ahhmazing! Love love love love that blazer! Love the colour of the blazer! It's so cheery and gorgeous! Love the color of the blazer! Can I say that I am getting so amped for the release of GG? Eeeep! I can see why this blazer is a favorite. I think I'm going to have to load up on fun blazers at Zara's in a few weeks. Don't know if I can resist after this post. This look is perfection. You look amazing in that color and I just love the shape of the blazer. Gorgeous gorgeous! The clutch is perfect with any outfit... so, I gotta go buy one STAT! gorgeous. I absolutely love this look! So soft and beautiful look with gorgeous turquoise pop of the color!!! Lovely! !